As such, Venezuelan supplies are exceptionally important to some U.S. Gulf Coast refiners in today's market. "We're out of balance right now and [sanctions] would make us more out of balance," said Rick Joswick, managing director for oil with the PIRA Energy Group, a unit of S&P Global Platts. The U.S. government has warned that it would take “swift economic actions” if the Venezuelan government proceeds with a July 30 move to rewrite the constitution to consolidate power in the hands of President Nicolas Maduro. With the country in shambles, the move is clearly intended to shore up the President's power in the face of fierce and growing opposition. The statement from the U.S government is widely interpreted as a threat to sanction state-owned oil company PDVSA, the government's main source of revenue. “My sense is there's an intensive review on a variety of options,” Michael Shifter, president of the Inter-American Dialogue, told the WSJ last week. “I wouldn't be surprised about discussions on very severe measures against the Venezuelan government. If so, I hope they do more good than harm. The precise details of what the sanctions might look like are not known yet, with a spectrum from mild to exceptionally aggressive. At the more minor end, the measures could amount to just sanctions on individuals, like the U.S. government did with Russia a few years ago. A more severe action reportedly under consideration would be a ban on Venezuelan crude oil imports into the U.S., which would likely have far-reaching implications for Venezuela, the U.S., and the oil market. Obviously, a ban would inflict staggering damage on Venezuela, which we'll get to in a moment. 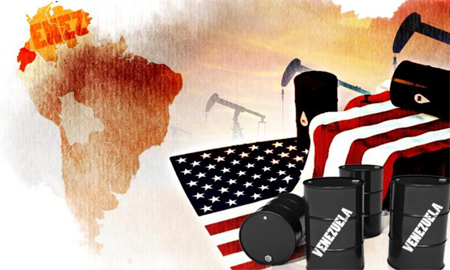 But the ban on Venezuelan crude would also affect the U.S., particularly American refining companies. EIA data shows the U.S. importing an average of 857,000 bpd from Venezuela in April, the latest month for which data is available. Crucially, much of that goes to the Gulf Coast, and nearly all of it is in the form of heavy crude, a type of oil for which Gulf Coast refiners are particularly equipped to handle. S&P Global Platts argues that a ban could strain the supply of heavier types of crude for U.S. refiners. For example, Phillips 66' Sweeny Refinery in Old Ocean, Texas imported over 46 million barrels of Venezuelan oil last year, the most out of any other refinery. Also, Citgo – which is owned by PDVSA – has a refinery at Lake Charles, Louisiana, a facility that imported 44 million barrels in 2016. A ban on Venezuelan oil would strain the market for heavy crude in the U.S., which is already tightening because of declining imports of medium sour oil from Saudi Arabia. Saudi Arabia is aiming to cut exports to the U.S. in an effort to drain U.S. inventories . In the most recent week for which data is available, the EIA said U.S. imports of Saudi crude fell to 524,000 bpd, a seven-year low. That has put a premium on medium-to-heavier types of crude. Other sources might not be able to replace the lost supply. Heavy crude from Canada is capped by pipeline constraints. Heavy crude production from Mexico and Colombia are both stagnant or in decline. Still, refiners would probably adapt if the sanctions were phased in rather than implemented abruptly. Joswick says that heavy crude refiners would be able to run medium varieties, while medium-based refiners would switch to lighter oils. But, if the U.S. government suddenly slapped a ban on Venezuelan oil, the move would be “very disruptive,” leading to a spike in medium and heavy crude prices, which would squeeze margins. “Those refiners would be scrambling, buying up whatever they can, probably cutting back their runs,” Joswick said. Ultimately, the cut off of supply would probably force refiners to scale back production by about 400,000 b/d for roughly two months. Meanwhile, Russia's Rosneft is reportedly looking to swap its stakes in the Venezuelan-owned Citgo for more secure stakes in Venezuelan oil fields. Citgo is owned by PDVSA, but based in the U.S., where it might get caught up in sanctions. Rosneft has a 49.9 percent stake in Citgo as collateral for a $1.5 billion loan it gave to PDVSA in 2016. A ban on Venezuelan crude into the U.S. could be ruinous for Citgo, so Rosneft wants to swap out its stake for more operational control of joint ventures inside Venezuela. For Venezuela, however, there are no good options. PDVSA could be forced to send more oil to Russia, or agree to more favorable upstream deals to Rosneft. That also carries a political price as President Maduro has been criticized for selling off the country's crown jewels. More importantly, though, is the effect of a potential ban on Venezuelan crude by the U.S. government. It could be disastrous for the average Venezuelan citizen, as the already decrepit Venezuelan economy would sink deeper into depression. More people would go hungry in the streets. Venezuela would scramble to find other buyers, but that could take time since only heavy crude processors would be interested. It would surely force PDVSA to offer steep discounts. The move “could bring PDVSA, and the Maduro regime, to its knees,” Jorge Salazar-Carrillo, an economics professor at Florida International University in Miami, told South Florida-based WLRN Public Radio . The one unknown is that aggressive action from the U.S. government has historically emboldened leftist rivals in Latin America, playing into the hands of strongmen who oppose Yankee imperialism. That would normally be the case, although this time could be different simply because Venezuela is at a breaking point. Nick Cunningham is a Vermont-based writer on energy and environmental issues. You can follow him on twitter. Petroleumworld does not necessarily share these views. Editor's Note: This commentary was originally published by Oilprice.com, 07/23/2017. Petroleumworld reprint this article in association with Oil Price.com.